When archiving, if the 'comment to podficcer' link could lead to the Ao3 entry for the podfic (link provided) that would be great, thanks! Podficcer notes: Both versions have intro music, the standard version has some (hopefully) unobtrusive sound effects. There should be no very loud noises or sudden changes of volume. This is Chapter 1 of 33 in total. Recorded for Fandom Trumps Hate. Summary: Lily's found out what Barney's job is. Summary: 50 years after Mulan's great victories, some things have changed (not everything). Could I get fandom tags for James Bond and Sesame Street? Summary: Q sobs and swears and thrashes against the ground until he can move no more, cheek pressed against the warm floor. Breathe, breathe. There are tears running down his cheeks and Q needs to tell himself to just breathe. O2 molecules, alveoli, deoxygenated blood, the biology of being alive. Fourth form basics of respiration. Q pulls up notes from the dregs of his memory and recites them backwards in his head. Summary: On my laptop, this lives as Loki’s kids megacrossover of doom. So, yeah. 12000+ words of healing and planning for vengeance. It was fun. Reader's note: Listen as I struggle to pronounce anything in any language. Summary: Eve knows Martha Jones is no more a doctor than Eve is a secretary. Notes: Once upon a time, I said: I want fic with Eve Moneypenny and Martha Jones! 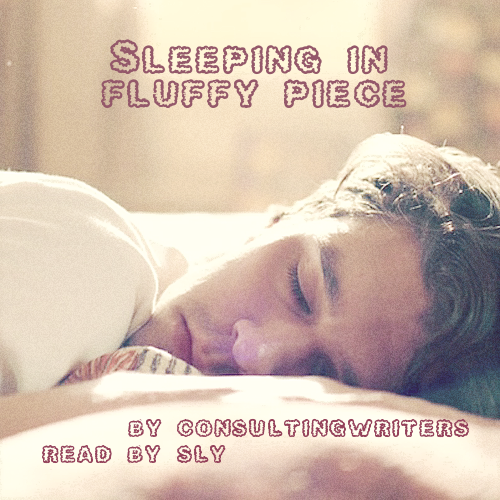 And then sunaga (who I actually know IRL) made this lovely ficlet for me and gave me permission to podfic it. Well...the podfic is finally posted. So many apologies for the delay! As usual, many thanks to Paraka for hosting. It's been a while since I've cross-posted , so here are the podfics I've made since my last cross-post. They are in Arrow, Bandom, Elementary, Harry Potter, Lewis, Person of Interest, Sherlock, Skyfall, Starsky & Hutch, Wicked Gentlemen, and X-Men fandoms. Links go to the original podfic posts. Archivists, these have all been archived, so just ignore this post, thanks! Writer's summary: In which there is snow and everyone is excessively British. Notes: This is a hilarious story that's been a WIP for way too long - the cover kind of gives it away :p I hope you enjoy! Thanks to lc2l for having blanket permission and to paraka for hosting! 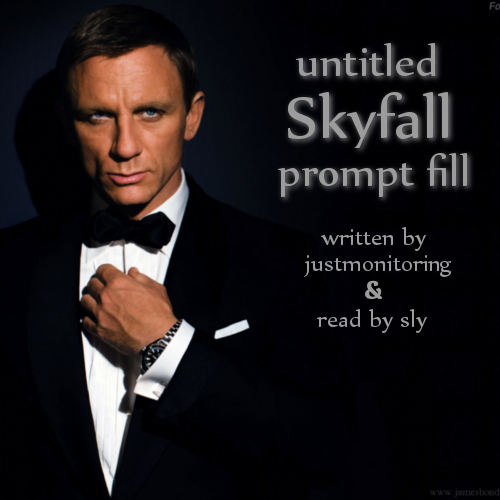 Fic info: Skyfall, Good Omens fusion. James Bond/Q. Rated M.
"Q," Bond says, fighting a smile. Q lets his own spread on his face like a forest fire, wide enough for the both of them. "007." It's neither of their real names, but they shake on it. They've been playing pretend for a long time. 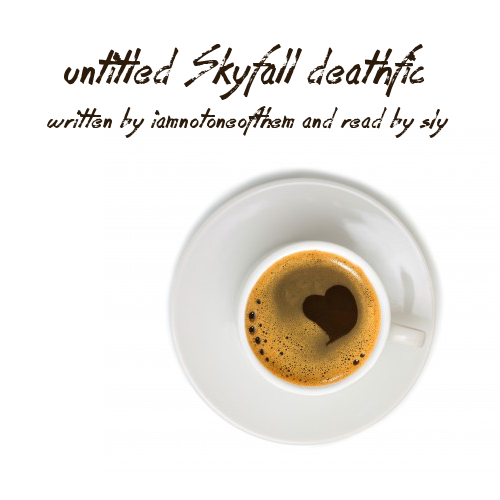 Fic info: Skyfall, Good Omens fusion. James Bond/Q, Q/Eve Moneypenny, James Bond/Eve Moneypenny, James Bond/Q/Eve Moneypenny. Explicit. "You see, she's a temptation herself. And you can't tempt a temptress." "It wasn't meant to. You're not supposed to do anything." "Not a thing." Q kisses the bewildered expression off Bond's face, though he's been keen to improve it over the years that only Q can really see it. "If she wants you, she'll come and get you." Author's Summary: Q is really Ariel - the ethereal spirit, not the mermaid, thank you very much. And M, sorceress, has sealed him to 007’s service and protection until such time 007 chooses to set him free. The problem is this would require explaining the situation to James Bond first. Summary:Bond is a warrior, a vestige of a war already long lost, with nowhere left to turn. Notes: Thanks to paperclipbitch for BP and analise010 for a speedy beta. Also, as always, thanks to Paraka for hosting. It's been a long, long time since I've cross-posted here, so here is a round-up of all the podfics that haven't been cross-posted. File formats mp3, m4b and streaming are all available at the original posts (linked below). Amplificathon? These are not for the competition, so no point tallies have been added (a lot of these were created not during the fest period). Archivists? These have all been archived, so your work here is done! Thank you!